I’ve had dreams in which I’ve achieved great things, and I’ve had nightmares in which I’ve died. However, the dreams that have affected me most aren’t memorable because of their extreme circumstances; in fact, they’re often set in mundane realities. They stay with me because their version of ‘me’ constantly shifts. Over the course of the dream, I will morph from one actor to the next—even responding (in the first person) to my own questions. As I move between these personae, my position and priorities likewise change; distaste for a thing becomes desire; indifference turns to urgency. Not everyone has these dreams, or so my friends tell me. But I’m glad I do, because they represent the true limit of the possible. What’s more freeing than being able to explore not only all relationships, places and times, but to do so as someone other than oneself? What insights can this bring, especially when it’s time to wake up? 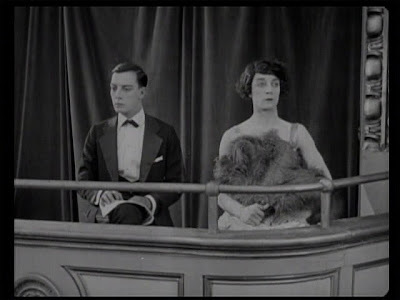 This is part of why I consider The Playhouse (1921) to be Buster Keaton’s finest short film. The Playhouse is an identity-bending dreamscape, surrounded by a real world so strange as to make the dream nearly plausible. And the dream sequence itself? It’s a laugh-riot, casting Keaton in more than twenty different roles at once, and allowing him to portray comedic styles utterly unlike the Great Stone Face that silent film fans are used to. For Keaton the artist and director, it was also a chance to push special effects, especially double exposure techniques, into new territory. The Playhouse is a dream, and is, I suspect, the result of one. The story is minimal. Really, it boils down to a question: if you were a lowly stagehand in a vaudeville theatre, surrounded by animals, comedians, rowdy acrobats and beautiful girls in tiny tops, what would you dream about? Answer: recognition. ...all of them are played by Keaton. And just as he would later show in College (1927), it takes great skill to make these characters look incompetent. The trombone jams, and requires oil; the clarinet goes up a musician’s nose. (No sound comedy could manage this gag, of course; we’d be forced to account for the horrible noise these men would be making). The audience doesn’t seem to mind. Maybe they’re biased. They, too, are played by Keaton, who balances the roles of elderly couple, poor mother and child, and wealthy husband and wife-about-town. These pairs chat between themselves in the theatre’s wings, then interact with one another after the mother and child begin dropping food below their own box. It’s a particular treat to watch Keaton in drag as the high-society-lady and pitching fits as the six-year-old brat. 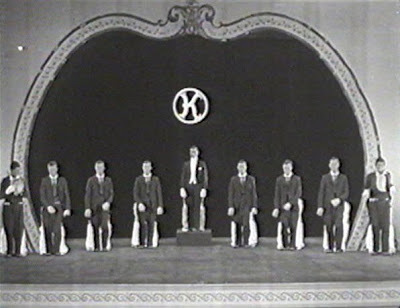 On stage, nine Keatons sing together in a minstrel show, followed by two Keatons performing a soft-shoe routine. And shortly after this the real Keaton—that is, the lowly stagehand—is shaken awake in his bed and told to get to work. His bedroom is a set. The walls are pulled away, and then so is the bed. The Playhouse turns to reality. ‘Reality,’ of course, is just another assortment of vaudeville weirdos in rapid motion. And the multiplicity of Keaton’s dream spills over into his conscious life, too; in the shapely form of twin bathing beauties (both played by Virginia Fox). Keaton falls in love with both, but only one loves him back. 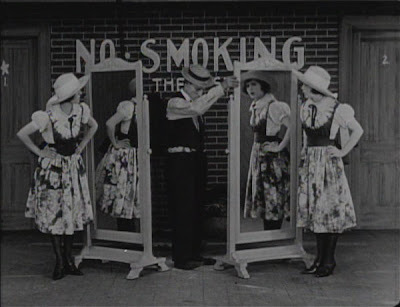 A running joke in the film is Keaton’s inability to hit on the right one. Each act is live, barely rehearsed, and prone to disaster. And so, over the course of about fifteen minutes, Keaton is called upon to perform as well as manage sets, sometimes failing in both roles, but always in a way that’s good for us. His most memorable moment comes after he frees an orang-utan prior to the animal act. With the ape escaped, it falls to the stagehand to take its place. The result ranks among the best work Keaton ever did—it’s a cross-species impersonation so uncanny that I actually learned more about how apes move. Watching Keaton push the boundaries of his medium in The Playhouse (and always managing to remain funny), I’m again reminded of the thematic harmony the film possesses. Dream washes into reality with barely a skip in tone, style or story; tricks never-tried prove seamless in the master’s hands. The bounds of comedic film widen and re-shape, while Keaton, too, expands his presence on film beyond the type of stock character he and his contemporaries typically relied upon. Now, I’ve heard it said that the special effects in The Playhouse were considered impossible before Keaton’s team produced them. So much the better. It means we’re seeing an artist’s craziest dreams become reality, making the reality of comedic film, from then on, a whole lot crazier, too. Kino International packages The Playhouse with Buster Keaton’s brilliant feature, The General (1927), and another of his finest shorts, Cops (1922). This film truly is the best of the Keaton shorts--all done in an era where "special effects" were strictly in camera. Keaton's grasp of how to make cinema go beyond its prior constraints,and, as you say, still be funny, is a joy. I CAN NOT BELIEVE I haven't seen this film!! I must search in out; in the meantime, thank you for this wonderful review. This is a favorite of mine, too. I was interested to compare it with Lupino Lane's "Only Me," where he played everyone in a vaudeville theater. Keaton's movie was much better paced.